Marty Truss brings a committed and tough, yet practical, approach to solving clients’ problems in complex commercial litigation. Working principally in the energy industry, Marty has represented clients in state and federal courts and arbitrations of complex business disputes throughout Texas, Oklahoma, Wyoming, North Dakota, Louisiana, Arkansas and New York. Marty frequently handles litigation involving disputes concerning mineral title, joint operating agreements, farmout agreements, pipeline agreements, IADC contracts, trade secrets, and securities fraud. 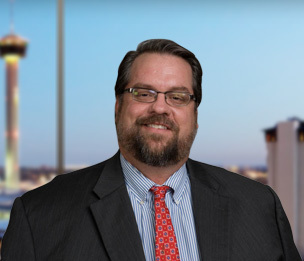 He is the Co-Leader of the Firm's Energy Industry Team and serves as the Office Managing Member of Dykema's San Antonio office. Marty Truss has represented major and independent producers, operators and other mineral interest owners, as well as oil field service companies, drilling contractors, pipeline companies and refiners in a wide variety of business litigation. Royalty Litigation. Marty successfully defended a publicly-traded exploration and development company in arbitration involving claims for $300,000,000 in royalty damages. Net award was a small fraction of pre-suit settlement offer. Trade Secrets Litigation. Marty served as trial counsel to TXCO Resources Inc., a publicly-traded exploration and production (E&P) company in successful prosecution of trade secret misappropriation claims against Peregrine Petroleum, LLC. Following a 41-day trial, the court awarded a multimillion judgment in favor of Reorganized TXCO, Inc. (reorganized through Chapter 11) on its claims for misappropriation of trade secrets. The court found that Peregrine solicited, obtained and misappropriated a substantial amount of TXCO’s trade secret information and data, both through its meetings with TXCO under a confidentiality agreement and through additional, improper channels. Mineral Title Dispute. Marty obtained a multimillion dollar recovery in litigation involving a mineral title dispute. Partnership Dispute. Marty obtained a multimillion dollar recovery in litigation involving partnership dispute and ownership of oil-producing properties. Trial and Appeal in Mineral Rights Case. Marty favorably resolved, through trial and appeal, a dispute involving title to thousands of mineral acres in South Texas. Class Action Resolved. Marty obtained favorable resolution for multiple publicly-traded and privately-owned oil and gas operating companies in a class action lawsuit filed in the Eastern District of Texas, Marshall Division. Defense of Drilling Company – Claims of Catastrophic Damage. Marty obtained favorable resolution for a publicly-traded drilling company in suit filed in south Texas by fourteen plaintiffs asserting causes of action for negligence, trespass and nuisance. Claims included catastrophic damage, including property damage to residences and personal injuries allegedly caused by drilling operations. He obtained a take-nothing judgment on the merits, dismissing all causes of action by all plaintiffs against client and paying no settlement money. Breach of Confidentiality and Non-Circumvention Agreement – Dispute Resolved. Marty obtained favorable resolution for publicly-traded drilling company in lawsuit filed in Oklahoma, alleging breach of confidentiality and non-circumvention agreement. Obtained judgment dismissing all causes of action against client and paying no settlement money. Defense of Claims of Fraud, Breach of Fiduciary Duty. Marty obtained favorable resolution for a publicly-traded refining company against claims for fraud, fraudulent inducement, and breach of fiduciary duty; obtained dismissal and paid no settlement money.